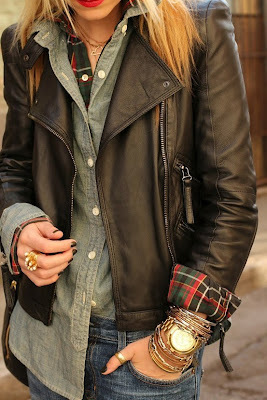 Great inspiration, need to fin me the perfect leather jacket! ive been searching for the perfect leather moto jacket for forever! its so hard to find one with a good fit that is not stiff! gorgeous jackets!! i still don't have a leather jacket...still looking for the perfect one! I only recently got my first leather jacket (from a leather artisan at a local market fair) and you are absolutely right about the fact that is a great versatile piece! I really like the simple black one of the Zara current collection. Excellent you bought one from Maje? I have two leather jackets - a blue one from Ted Baker from years ago (I still wear it now and then) and a brown coloured one from All Saints which pretty much goes with everything, like you say. This in between weather here in NYC is the perfect time to wear it, as well.